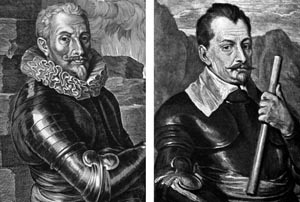 Swedish King Gustavus Adolphus squared off with Imperialist Count Albrecht von Wallenstein at Lutzen in 1632 midway through the Thirty Years War. The stage was set for a titanic clash. King Gustavus II Adolphus of Sweden rode forward confidently, digging his heels into Streiff, his war horse, signaling the animal to quicken his pace and jump the ditch that was just ahead. With his muscles rippling and his nostrils flaring, the magnificent beast cleared the ditch and was soon several paces beyond the king’s small entourage. It was November 16, 1632, and the Swedish army and their German allies were fighting a desperate battle against the forces of the Holy Roman Emperor Ferdinand II. The king was initially leading a cavalry charge, but became separated from his troopers. Only a handful of men continued to follow him. A lingering fog clung to parts of the battlefield. The gray blanket worsened when it mixed with acrid smoke arising from the burning town of Lutzen. Completely disoriented, the Swedish king was behind enemy lines and in grave peril. An enemy shot struck the king in his left arm, just above the elbow. At the same time, the cottony fog began to dissipate, revealing Imperial cuirassiers not far away. A moment later the king’s entourage caught up with the wounded monarch. “The king bleeds!” they cried. “The king is shot!” Gustavus tried to calm them, but the pain was too great, and the wound so severe that he began to succumb to shock. “Cousin, I am sore wounded, help me make my retreat,” he said to Duke Franz Albrecht of Sachen-Laurenburg. Gustavus always led from the front. His body was mute testimony of his bravery, bearing scars from no fewer than 13 old wounds. But an earlier neck injury from a Polish soldier was particularly severe. The injury had left him with two paralyzed fingers, and an inability to wear heavy armor. Instead of a steel breast and back plate, he wore an elk skin buff coat. That made him particularly vulnerable to firearms. 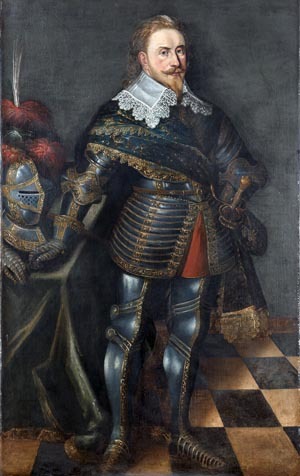 An 18-year-old Swedish page, Augustus Leubelfing, tried to give the king his horse but was mortally wounded before the transfer could be performed. Gustavus’ bodyguard also was quickly cut down. The fast-riding Imperialist troopers were rapidly closing the gap. As they grew near, it was clear the king’s fate was sealed. An Imperialist officer recognized the king, who was reeling in his saddle. Unable to maintain his balance, Gustavus slumped to the ground. There was no mistaking the oval face, close-cropped blonde hair, piercing blue eyes, and neatly trimmed Van Dyck beard. The Swedish king’s features were well known throughout central Europe. “Here’s the right bird!” the Imperialist officer shouted as he fired a round from his large pistol into the king’s back. Other Imperialist troopers leaned forward and stabbed him with their swords. Bleeding from several wounds, dazed and in agony, somehow Gustavus managed to retain consciousness. It was said that one of the enemy troopers asked, “Who are you?” Summoning his last reserve of strength, Gustavus replied, “I was the King of Sweden” His use of the past tense was inaccurate, but perhaps by only two minutes. When a troop of Swedish cavalry arrived, one of the Imperialist troopers delivered the fatal coup de grace by firing a pistol shot into the king’s temple. Gustavus’ meteoric career had been significant enough to earn him the sobriquet “Lion of the North.” At the time, Gustavus was waging war south of the Baltic Sea ostensibly to rescue fellow Protestants from religious oppression at the hands of zealous Catholic Holy Roman Emperor Ferdinand II and his Papist followers. Sweden was far from a democracy, but its king was enlightened enough to desire popular support. That is the reason that the Swedish crown made sure that Lutheran clergy denounced Ferdinand II with thundering jeremiads each Sunday. It was a kind of pulpit propaganda that worked well in a country that was staunchly protestant. Yet Sweden’s entry into the Thirty Years War was not a foregone conclusion, and not necessarily motivated by religion. Surviving records from the king’s council meetings make it clear that religious zeal was a distinct second to the hard-headed realities of European power politics. The chance of an Imperial invasion of Sweden, and a subsequent forced conversion to Catholicism, was virtually nonexistent. Gustavus and his ministers grasped this, but by the same token they were not eager to have a powerful Catholic enemy at Sweden’s doorstep. But with the German principalities of the Holy Roman Empire in turmoil, there was an opportunity to take control of the Duchy of Pomerania. This would not only allow Sweden to dominate the Baltic Sea, but also provide a barrier against possible Imperial ambitions. By so doing, he would gain a staging area from which to launch future operations against Emperor Ferdinand. The Swedish invasion of Pomerania marked Sweden’s debut as a great power, a status it maintained for nearly a century. Gustavus landed on the coast of Northern Germany with 13,000 men on July 6, 1630. Four days later, the Swedish king occupied Stettin, the capital of Pomerania. Gustavus hoped the Protestant princes of Germany would join him and increase his numbers. Although they eventually would see him as their best hope to counter the Imperialist juggernaut, he was not initially greeted with open arms. The German Protestants knew little about him, and their rulers were wary. When he arrived in Germany no one was sure if he was a savior or an opportunist. Field Marshal Albrecht von Wallenstein, left; Imperial general Johann Tserclaes, Count of Tilly. Gustavus received badly needed financial support. He initially believed that the Baltic provinces could support his army, but his troops quickly picked it clean of crops and livestock. Unable to fund the cost of his expeditionary army alone, he soon received support from an unlikely ally: Catholic France. Cardinal Richelieu, King Louis XIII’s chief minister, did not let his status as a Catholic clergyman get in the way of his diplomatic efforts on behalf of France. Emperor Ferdinand II was as much France’s enemy as he was Sweden’s enemy for the Hapsburg dynasty thwarted France’s attempts at expansion. After securing Pomerania, the Swedes methodically set about controlling Mecklenburg, the Baltic province that adjoined Pomerania to the east. Gustavus offered assistance where he was able to the Protestant peoples of northern Germany. As early as October 1630, Gustavus had pledged through his representatives to help the predominantly Lutheran population of Magdeburg in Saxony improve their defenses in anticipation of an Imperialist assault. Gustavus sent Dietrich von Falkenberg, a Hessian adviser on his staff, to oversee the city’s defenses. The emperor had ordered that the city restore lands allegedly confiscated from the Catholic Church, but the Lutherans openly defied the order. Because of that decision, Ferdinand ordered Imperial general Johann Tserclaes, Count of Tilly, to force the city to comply with the order. Tilly, who had been operating in Mecklenburg in March 1631, found it impossible to sustain his forces in the region and already had set his sights on Magdeburg, which he believed was well stocked with provisions. Gustavus attacked Frankfurt-on-Oder in Brandenburg on April 13 in an effort to get Tilly to break off his siege of Magdeburg, but the tactic failed. Gustavus remained fixated on securing Brandenburg at the expense of the people of Magdeburg. He told von Falkenberg that he would not be able to march to his assistance until June. The Catholic sack of the predominantly Lutheran city of Magdeburg in May 1631 drove the north German princes into the arms of King Gustavus. As the days dragged by, Tilly became increasingly convinced that Gustavus would arrive at any moment to relieve the city. On May 17, the Imperialists stormed the city in a 48-hour assault but were repulsed. The two sides parlayed, but on May 20 Tilly’s second-in-command, Count Gottfried Heinrich Graf zu Pappenheim, ordered another assault without seeking Tilly’s permission. The defenders were caught by surprise, and starving Imperialist soldiers swarmed into the city. Fire consumed the buildings as soldiers from all corners of Ferdinand’s far-flung empire sacked the city and massacred its people. The Imperialist soldiers, the majority of whom were mercenaries, raped women and tortured men. At least 20,000 died in the conflagration. The Sack of Magdeburg shocked German princes into allying themselves with Gustavus. Both John George of Saxony and Frederick William of Brandenburg, both of whom were prince-electors who had the privilege of casting votes for the Holy Roman Emperor, allied themselves with the Swedes. Up to that point, though, Gustavus had yet to prove himself in a major battle against the seemingly invincible Catholic forces. The two prince-electors were allies in name only for they were prepared to switch sides if the Swedes suffered a major defeat. The first major test of Gustavus’ capabilities in a pitched battle against the Catholic forces came at Breitenfeld in September 1631. Tilly’s Imperialist army also included troops from the Catholic League, an alliance of Catholic German princes led by Duke Maximilian of Bavaria. The Swedish-Saxon army had 40,000 men. In contrast, Tilly had 32,000 men. He was sure he could easily beat the Swedish upstart, but he badly underestimated his opponent. The Battle of Breitenfeld fought on September 7, 1631, was the German debut of the so-called Swedish system. The system was a modified version of tactical reforms introduced by Count Maurice of Nassau who had served as Captain General of the Dutch army. Gustavus, an avid disciple of Maurice, took Maurice’s augmented and expanded Maurice’s reforms in regard to how troops were deployed in battle. The Swedes won a decisive victory with their innovative tactics at Breitenfeld in Saxony. Tilly’s Imperial army had been the favorite at Breitenfeld. Gustavus decisive victory over Tilly astonished both Catholic and Protestant leaders. The battle began badly for the Swedes when their untested Saxon allies quit the field. This left 23,000 Swedes facing 35,000 Imperialists. But the unflappable Swedish King extended his line to compensate for the loss of his left wing. Late in the day Gustavus launched a counterattack that smashed the Imperial center. Tilly and his troops shamefully fled the field; in so doing, they handed the Swedes a decisive victory. But the Swedish king put his faith in firepower, not in ancient tactics. Pikemen were still necessary. The purpose of the pike troops was to protect the musketeers, also known as shot troops. Gustavus reduced the number of pikemen and increased the number of musketeers. Under the Swedish system musketeers were trained to fire rapidly; that is, at least as rapidly as a matchlock could be fired. Ranks were relatively shallow at only six ranks deep, but on command musketeers could double the files and add firepower. In this technique the rear ranks moved between the front ranks, making a three-rank extended formation. The front rank would kneel, the middle rank crouch, and the third rank stand. On command all three ranks could fire simultaneously. This became known as the Swedish salvo, and it was capable of shattering an enemy assault. The Swedish shot troops delivered their salvo at point-blank range, which was between five to 10 paces. At such a short distance even early smoothbore weapons could be deadly accurate. After they had shattered the enemy line, the musketeers would advance and finish off the job with their swords and musket butts. The Swedish matchlock often had a fishtail-shaped stock, which made it effective as a club in hand-to-hand fighting. Artillery also would protect the flanks of the pike-musketeer formations. Sweden was blessed with an abundance of iron ore, so the country could produce some exemplary cannon tubes. Artillery of the period was large, heavy, and nearly impossible to transport across soft ground or mud. Gustavus encouraged his gunsmiths to develop lighter barrels made of new alloys. He established three calibers for regimental cannon: 3, 12, and 24 pounder. As for the Swedish cavalry, its quality varied widely. The Swedish and Finnish horsemen, both of which were drawn from the lands of the Swedish empire, were the best in army in comparison to the German cavalry. Their Scandinavian horses were so small that they resembled ponies, which was something the Germans found highly amusing. Although trained in the Swedish style, the majority of the infantry in Gustavus’ army were Germans, although there were some elite Swedish infantry units. In addition, the Swedish army also had Scottish mercenaries. Gustavus was deeply fond of the Scots who he treasured for their steadfast bravery. At Lutzen, only one-tenth of the infantry and one-quarter of the cavalry were ethnic Swedes or Finns. Following his victory at Breitenfeld, Gustavus moved into southwestern Germany, hoping to bring the war to a successful conclusion for the Protestant cause. Tilly established a strong defensive position on the east side of the River Lech near the Swabian town of Rain. Gustavus faced the difficult task of forcing a river crossing in the face of an entrenched enemy. In the Battle of Lech, which was fought on April 15, 1632, Gustavus bombarded Tilly’s army with as many as 72 guns, which distracted the Catholics long enough for his troops to build a bridge and establish a strong foothold on Tilly’s side of the river. Swedish artillerists devastated the Imperialist-Catholic League army. A cannonball inflicted a mortal wound on Tilly early in the engagement. Command devolved to Johann von Aldringen, but he also was struck by shrapnel from a Swedish cannonball that fractured his skull. At that point, Maximillian ordered a general retreat. Tilly died two weeks later. The triumphant Swedes moved south. Gustavus plundered the Bavarian capital of Munich on May 17, 1632. He stayed for 10 days removing whatever items could be used by his army before moving on. It seemed at that point that nothing could stop the Swedish juggernaut. Ferdinand worried that Gustavus might even besiege Vienna. Ferdinand decided that his best course of action was to reinstate Field Marshal Albrecht von Wallenstein. The emperor had dismissed Wallenstein in September 1630 because he feared that the powerful Imperial general might be planning a coup to overthrow him. But with Vienna threatened by Gustavus’ seemingly unstoppable Swedish army, Ferdinand had little choice but to reinstate him, which he did on April 16, 1632. Wallenstein quickly retook Prague from the opportunistic Saxons. Wallenstein was in some respects a modern general. His troops were usually well provisioned. That was a major achievement itself given that Catholic and Protestant armies had heavily pillaged Central Germany by that point in the war. During his service to the empire, he had transformed his estates in Bohemia into a vast military depot. Scores of workshops and factories worked unceasingly to produce arms and clothing for his troops, and the effort was on a massive scale. Wallenstein was a meticulous planner who obsessed over the smallest of details. By the time he was recalled, he was well past his prime. He suffered from gout, and it had taken a heavy toll on his body over the years. Still, he was the most competent commander the Imperialists had at the time, and Gustavus would find him to be a formidable opponent. The Swedish king continued campaigning in southern Germany throughout spring 1632, but eventually shifted north to Upper Palitinate. He arrived at Nuremberg on June 16 and constructed a fortified encampment in Nuremberg. Always the master recruiter, Wallenstein had assembled a formidable army of 55,000 men with which to confront the Gustavus’ 18,000 troops. Wallenstein arrived in Nuremberg in July and established his own fortified encampment nine miles west at Alte Veste. Wallenstein set his troops to work fortifying a hill upon which a dilapidated castle was located. He set his troops to work entrenching and constructing abatis in the event of a Swedish attack. Meanwhile, Gustavus sent word to Sweden that he needed immediate reinforcements. Swedish Lord High Chancellor Axel Oxenstierna raised 24,000 men and marched to the king’s assistance arriving on August 27. When Gustavus received the reinforcements, he attacked with his infantry on September 3. Heavy rain made it difficult to bring regimental guns into action on the rugged ground. For their effort, the Swedes only captured a few outer works at the cost of 2,500 casualties. Gustavus departed for Swabia where he intended to camp for the winter, but events would force him to change his plans. Wallenstein marched north with the intention of knocking Saxony out of the war. Duke John George, the Saxon Elector, was not much use in the field given that he was a serious alcoholic. But his support was crucial to Gustavus’ Protestant coalition. No one knew this better than Wallenstein. “If the Elector is lost, the King [of Sweden] must be lost too,” said Wallenstein. Wallenstein dispatched a small Imperialist force under Feldmarschalleutnant Heinrich Holt to pillage Saxony. Holt, a Danish Protestant who had switched sides, carried out his orders magnificently. Holk’s cavalrymen systematically pillaged Saxony in late summer 1632 stopping only at the gates of Dresden. But the conquest of Saxony required a concerted effort by all of the Imperialist forces. For that reason, Wallenstein’s army of 18,000 men rendezvoused with Holt in mid-October. Meanwhile, Pappenheim marched east from his area of operations in northwest Germany to join them. Instead of attacking Dresden, Wallenstein decided to besiege Leipzig, which fell to him on November 1, 1632. When Gustavus learned that Pappenheim was approaching Erfurt, he became deeply alarmed. Erfurt was the center of the German road network; if it fell to the Imperialists, then Gustavus’ line of communications to Sweden via the Baltic ports was in danger of being severed. The Swedish army embarked on a forced march to Saxony covering 370 miles in 17 days. To prevent the Imperialists from securing Erfurt, 3,000 Protestant troops led by Duke William of Saxe-Weimar occupied it. By November 7, Gustavus’ had concentrated his forces on Saxony in anticipation of a battle despite the lateness of the campaigning season. November 1632 was unseasonably cold, and there were not enough villages in the region to shelter the troops of the two large armies occupying western Saxony. 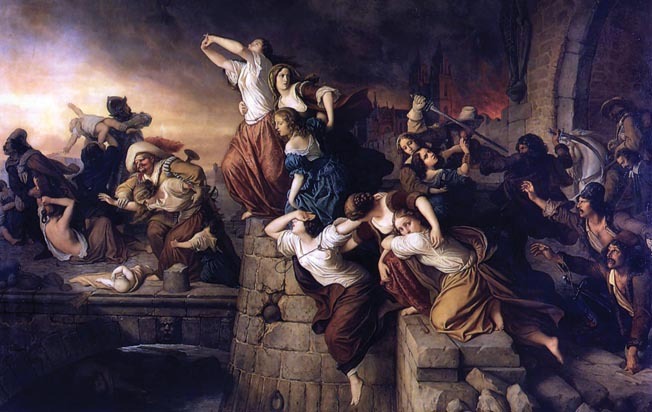 Wallenstein received disturbing reports that Protestant forces were threatening Cologne, which was the seat of one of the Holy Roman Empire’s three archbishop electors. Pappenheim requested that Wallenstein allow him to lead his force west to North Rhine-Westphalia in order to deal with the threat. Wallenstein reluctantly agreed to the request, and a large group of Imperialists departed on the mission. When Gustavus received information on this breakup of Imperialist forces, he sensed an opportunity. He believed that since Wallenstein was nearby the Swedes might be able to surprise his weakened forces. He believed a victory would redeem his army following the reverse it suffered at Alte Veste. Gustavus’ plan miscarried due to war’s unpredictable nature. The Swedish army was taking the main road from Leipzig to Lutzen, but there was a small force of Imperialists in the vicinity commanded by Imperialist Generalwachtmeister Rudolf von Colloredo. Although Colloredo had only 500 dragoons, it was unlikely that he could stop the Swedish army. But luck was with Colloredo. By a twist of fate 500 Croat horsemen were in the area. Legend has it that their commander had lingered at a local inn to engage in amorous adventures. This gave Colloredo just enough men to fight a delaying action while he sent a warning back to Wallenstein. Colloredo had excellent defensive terrain at his disposal. He took up a position behind the Rippach, a tributary of the Salle River. The Rippach was a narrow stream. Marshes lined its approaches, thereby adding a second layer of defense. A cavalry clash with wheellock pistols and sabers. The Croats functioned as superb light cavalry for the Imperialist armies. A skirmish developed on November 15 that bought the Imperialists precious time. The Croats gave a good account of themselves, even though they were decimated by the action. When a local guide led the Swedes to a ford on the stream, the skirmish ended. The Croats withdrew, and the Swedish army crossed the Rippach. By then it was 4 pm, and nightfall was fast approaching. “Oh, for a few hours of daylight,” said Gustavus. There was nothing to do but camp for the night and take on Wallenstein in the morning. From their location, the Swedes come see the glow of Imperialist campfires. The Swedes had travelled without tents, so the tired soldiers bedded down in the open, more or less in the order that they had marched that day. The Swedish King retired to his carriage for the night. Even senior officers, many of them with noble blood, had to follow their soldiers and sleep outdoors, their only roof a canopy of twinkling stars. When Wallenstein received word from Colloredo that the Swedes were coming he sent an urgent dispatch to Pappenheim at Midnight on November 15-16 ordering him to return as soon as possible. Pappenheim’s troops were widely scattered after a long day spent pillaging local villages. It took time to sort things out; nevertheless, Pappenheim’s cavalry was on the road to Lutzen by 2 am. Since there was a note of urgency in Wallenstein’s missive Papenheim went ahead with just his cavalry. The infantry would resume the march at first light, and the slow-moving artillery would follow as best it could. Pappenheim drove his troops as hard as possible. In the meantime, Wallenstein had to prepare to meet the Swedish army as best he could. The Imperialist commander preferred to fight behind field fortifications because they negated an enemy’s advantages, which in this case was the devastating firepower of the Swedish infantry. If Wallenstein he could establish a strong defensive line, the Swedes might be kept at bay until Pappenheim’s reinforcements arrived. Wallenstein’s right was anchored on the town of Lutzen, a cluster of 300 houses surrounded by a wall and dominated by a small moated castle. The surrounding region was pancake flat and boggy in spots, even though some of the firmer ground was good enough to support some farms. There were two made-made canals that helped drain the viscous muck, the Muhlgraben and the Flossgraben. The former was fairly easily crossed, but the latter was wide enough to thwart a crossing. Not far from Lutzen there were a few windmills, creaking and groaning as the northern breezes caressed them, which stood on a knoll. The hill was really just a gentle, almost imperceptible rise only a couple of feet high, but in this flat region it stood out like a beacon. Wallenstein decided to place the 14 guns of his main artillery battery atop the hill. The windmills provided the necessary wood to fortify the battery. Wallenstein also made use of the Leipzig post road, one of the better roads in Germany. It came out from Lutzen in a northeasterly direction, running for about a mile and a half before crossing the Flossgrabben and exiting the future battlefield. There were two dry drainage ditches on either side of the road, and Wallenstein lost no time in having his men dig them out and convert them to full-fledged trenches. For Wallenstein excavation tools, such as the pick or spade, were as important as pike or musket. Once the trenches were finished they were filled with musketeers. Wallenstein’s army was even more of a polyglot force than the Swedish army. The only thing that bound this heterogeneous force together was its religion, which of course was Catholic. Like Tilly’s Catholic League army, Wallenstein’s army had Austrians, Czechs, Italians, Hungarians, Poles, Croatians, and Germans. Imperialist cavalry had several types, but the most formidable were the cuirassiers, whose breastplate and back plate of armor were blackened to prevent rust. Their weapons were swords and pistols, and they knew how to use them. The Croats were light cavalry, colorful men in Eastern garb that included fur hats and long coats. Though they were labeled Croats many were Magyars from Hungary, not Croats from Croatia. Imperial infantry usually wore more armor than the Swedes, and in battle they formed battalions of 1,000 men. On campaign there was bound to be attrition, but regiments weaker in numbers were combined to make sure battalion strength rarely wavered. Wallenstein’s army was a formidable force, and would not be easily overcome even by Gustavus’ brilliance. The Swedish army had formed up by 7:30 am, only to discover a thick fog had blanketed the area overnight. Gustavus and his troops held a religious service, after which the king gave two rousing speeches. One was addressed to his Scandinavian troops. He promised them reward and honor if they did well, and disgrace and virtual banishment if they did not. The other speech was directed at his German allies. He reminded them that they were fighting for religious liberty. It is unknown how many soldiers actually heard the king’s pre-battle harangues; after all, the Swedish army had around 18,000 men. But probably a good many heard the King’s supplication to the Almighty, which he delivered in a loud voice. He started the fervent prayer with “Jesus! Jesus! Jesus!” Whatever his political machinations, few could doubt his sincere piety. A few patches of fog remained at mid-morning, but enough had dissipated to begin the battle. With the fog largely gone, Gustavus’ next problem was where to actually engage the enemy’s main body. The meadows to the east of Lutzen were waterlogged and impractical for supporting masses of troops. The only alternative would be to go west, where there was a fairly flat and open plain. But before they could reach the plain the Swedes had to cross the Flossgraben and Muhlgraben canals. The Flossgraben was wider than today and icy cold, so that the idea of wading through it on foot was far from attractive. There was a bridge at the village of Meuchen, but no one could expect an army of 18,000 to use a single narrow span. Luckily the Flossgraben’s main purpose was to float firewood down to two salt refineries so that there was plenty of debris around to construct crude bridges. The Swedes started harvesting the waterlogged planks and before long troops were crossing over several rickety but still effective spans. The Swedish King chafed at the delays, but eventually the Swedish battle array began to form. The right, which was the traditional position of honor, was under the king, while the left was led by his second in command, Duke Bernhard of Saxe-Weimar. Between the two wings the king placed infantry brigades under Generalmajor Nils Brahe. Brahe did not have independent control, though. Gustavus could control the right infantry brigades if needed, and Bernhard the left units. Baron Knyphausen commanded the rear infantry brigades, as well as the cavalry reserves. When either wing needed fresh squadrons, Knyphausen would furnish them. Knyphausen was the third in command. He would take over if both Gustavus and Bernhard were killed or badly wounded. The battle began at 10 amwhen the King of Sweden ordered a small battery to open fire. Wallenstein waited, willing to endure these Swedish pinpricks for the moment. But after a short time the Imperialist cannons roared to life, flaming in counterbattery. Initially, though, all was sound and fury signifying little or nothing, because there were few casualties on either side. At that point, Wallenstein decided to put Lutzen to the torch. The town walls were in poor condition, and it was estimated that the town would need 1,000 men to properly garrison it. Wallenstein could only spare 400 men. He feared being outflanked. The only viable option was to burn Lutzen to deny it to the Swedes. Four hundred Imperialist troops still remained in Lutzen Castle, and for that reason Wallenstein had not entirely abandoned the position. The Imperial commander had issued explicit orders for his troops to lock the townspeople of Lutzen in the castle’s cellars to prevent them from extinguishing the flames. The main action began on the Swedish right, where King Gustavus had six regiments of Swedish and Finnish cavalry, the best horsemen in his army. The Swedish King also had groups of 200 musketeers, and Nils Brahe’s two right-hand infantry battalions. The Swedish king noticed that there was a screen of Croats just in front of him. Lightly armed, they were not a great threat, but just beyond them were some groups of Imperial cuirassiers. With their dark horses and black armor, they seemed like rampaging symbols of death itself. “As for [the Croats], I care not for them, but charge me those black fellows soundly, for they are the men that will undo us,” Gustavus said to Torsten Stalhandske, his Finnish cavalry commander. The Finns spurred their horses into a furious gallop, veering northeast to cross the Leipzig road where Imperialist trenches had not yet been dug. Seeing this seemingly irresistible tidal wave of steel and horseflesh, the Croats rode off without trading blows. It is not clear where the black-armored Imperial cuirassiers were located at that point, but as they advanced the Finns encountered little opposition. But Wallenstein had employed a clever ruse. To bulk up his anemic left flank, the Imperialist general had created mock formations. Camp followers and baggage handlers became the fake troops. Carrying poles with sheets to simulate battle flags, they were quite impressive from a distance, but apt to become demoralized and disrupted by the slightest of threats. When Gustavus’ Finns charged into their midst, the subterfuge fell apart. The fake troops in the mock formations scattered. Worse yet, the Croats and fake troops through that Wallenstein had ordered the evacuation of the baggage train to Leipzig. Sensing an opportunity for easy pickings, both groups lost no time in looting their own baggage train. Grabbing what they could, both Croats and the fake troops started to flee with their arms full of plunder. The Imperialist left was on the verge of collapse when Pappenheim and his cavalry arrived at Noon. The arrival of fresh troops gave Wallenstein’s left wing fresh heart, and order was restored. It was Pappenheim’s fleeting moment of glory for he would not live long enough to fully savor it. He was mortally wounded while leading a cavalry charge. Wallenstein’s letter summoning him to Lutzen was in his pocket when he was slain. It was around this same time that Imperialist cavalry killed Gustavus who was fighting on the Swedish right flank. Legend says that when the Swedish army heard of their terrible loss, they were filled with fury and a desire to avenge the king, a rage that spurred them on to victory. But in reality very few soldiers in the Swedish army knew of the king’s demise, even though the news spread as the battle progressed. Gustavus’s white horse flees the field at Lutzen. The Swedes had a number of gifted generals who continued to lead Swedish forces in Germany after the king’s untimely death. In any event Brahe was determined to fulfill the King’s earlier orders to the letter. 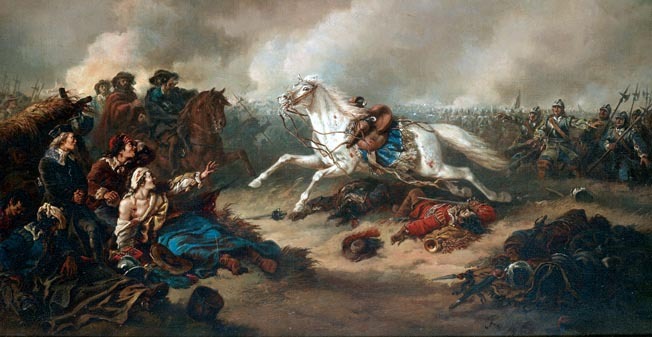 The king’s instructions stated for him, “to go boldly at the enemy and not take heed of their numbers, nor to fire any salvos until the Imperial musketeers had fired themselves.” The idea was to mow the enemy down before he could reload, then advance before he could recover, but this time it did not work. The elite Swedish Yellow Brigade was shredded by an Imperialist volley delivered at point-blank range that felled most of the brigade’s officers. Without proper direction, the Yellow Brigade could not adequately return a volley. The Swedish Blue Brigade, another elite unit, suffered its own ordeal. The Blue Brigade advanced with parade ground efficiency against an Imperialist infantry, but in so doing its soldiers veered off. This loss of direction inadvertently created a large gap between their brigade and supporting Yellow Brigade. The Imperialist cavalry raced to exploit the error. Archaeologists recently confirmed the Blue Brigade’s destruction. A mass burial site unearthed in 2011 contained the skeletons of 47 Blue Brigade individuals, ranging in age from 20 to 30. An analysis of the teeth shows that all except one of the soldiers in the mass grave was German. Their findings allow for a greater understanding not only the battle, but also of life in 17th century Europe. A soldier’s life was certainly hard. Some skeletons show signs of healed wounds, while others have the marks of syphilis. But even more telling perhaps are the signs of malnutrition when they were children. Common soldiers, no matter their skill level, were of peasant stock, and peasants often endured crop failures and famine. But virtually all the buried soldiers were killed by firearms, and some of them still had bullets lodged in their skulls. Others were dispatched by swords that left deep gashes in the skull. Swedish fortunes were at their nadir around 2 pm. Two of Sweden’s best infantry brigades had been destroyed, and the others decimated. The right wing also was in trouble, in part because it was essentially leaderless. The right flank soldiers, bloodied, and exhausted, were growing anxious due to Gustavus’ mysterious disappearance. Some cavalry from the rear squadrons abandoned the field, thinking discretion was the better part of valor and others followed suit. Reserve commander Knyphausen kept his head, moving in reserves to plug up the gaps in the weakening Swedish line. Swedish preacher Jacob Fabricus gathered a few officers around him and they all started singing a Lutheran hymn. Religion was a strong force in the 17th century and hearing the hymns actually calmed the many of the soldiers and stemmed the panic. By that time, Duke Bernhard had taken overall command of the Swedish army. “[I cannot] think of retreat, only of dying or winning the battle, and of making his revenge as memorable as their loss,” he said upon receiving confirmation of the king’s death. As darkness fell, Swedish troops managed to take Wallenstein’s battery located at the windmill. After so much blood and effort, it seemed like a meaningless achievement. After all, some of the best regiments in the army had been shattered, reduced to bloodied remnants, and above all their beloved and charismatic king was dead. Though they did not realize it yet, the Swedes had won the day. Wallenstein had been appalled by the losses his army had sustained, and doubted if his troops could perform well the next day. He had been hit by a spent musket bullet that bruised his thigh, but did not break the skin. But what really pained the Imperialist commander were the reports he received of heavy casualties. Although some Imperialist officers expected their commander to renew the battle the next morning, Wallenstein instead ordered his units to withdraw under cover of darkness. Following the Battle of Lutzen, Wallenstein quartered his mercenary army in Imperial territory but refused to support the Imperial war effort. He also entered into peace negotiations with France, Sweden, and various German powers. The emperor ordered his removal, and he was assassinated on February 25, 1634. Gustavus’ intervention in the Thirty Years War had kept the Protestant cause alive. The Swedes remember Lutzen as Gustavus’ most glorious victory. After the death of the charismatic Swedish king, it was apparent that Sweden could not win the war alone. Although they had long financed Protestant operations, the French intervened militarily in 1635 and recruited Bernard of Saxe-Weimar to help them wage war in southwestern Germany. The combined power of France and Sweden eventually proved too much for the Catholics. The protracted conflict ended with the Peace of Westphalia in 1648. Tags 30 Years War, Blue Brigade, Breitenfeld, Count Gottfried Heinrich Graf zu Pappenheim, Count of Tilly, Duchy of Pomerania, Duke Franz Albrecht of Sachen-Laurenburg, Holy Roman Emperor Ferdinand II, ield Marshal Albrecht von Wallenstein, Johann Tserclaes, King Gustavus II Adolphus, Lord High Chancellor Axel Oxenstierna, Lutzen, Magdeburg, matchlock, Military Heritage May 2018, pike, Protestants, Sweden.